For every VM replica, Veeam Backup & Replication creates and maintains a number of restore points. If the original VM fails for any reason, you can temporary or permanently fail over to a VM replica and restore critical services with minimum downtime. If you cannot fail over to the latest VM replica state (for example, in case corrupted data was replicated from source to target), you can select a previous restore point and fail over to it. 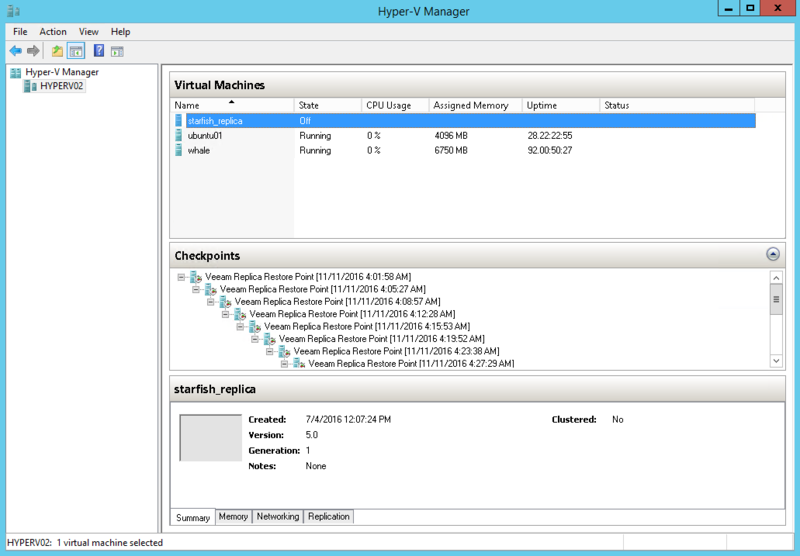 Veeam Backup & Replication utilizes Microsoft Hyper-V checkpoint capabilities to create and manage replica restore points. During the first replication job session, Veeam Backup & Replication creates a copy of the source VM on the target host. During every subsequent replication job session, it adds a new checkpoint to the checkpoint chain for the VM replica. Blocks of data that have changed since the last job run are written to the checkpoint differencing disk, and the checkpoint differencing disk acts as a restore point. VM replica restore points are stored in a native Microsoft Hyper-V format next to replica virtual disk files, which allows Veeam Backup & Replication to accelerate failover operations. To fail over to the necessary point of the VM replica,Veeam Backup & Replication does not need to apply rollback files. Instead, it uses a native Microsoft Hyper-V mechanism of applying the checkpoint. You can specify retention policy settings for replication jobs — define how many retention points you want to keep for every VM replica. Veeam Backup & Replication will keep only the specified number of points and remove outdated checkpoints.